From the moment Jamie and Jessica meet, the attraction is white-hot. Once-overly-focused Jamie can think of little else than sweet, smart, and alluring Jessica, and Jessica discovers a side of herself she never knew existed. But when Jamie's business encounters trouble and his attorney and best friend intervenes, he proves that the brown-haired beauty is too distracting for Jamie. To make matters worse, it appears that Jessica might not be who she says she is, turning Jamie's life--and his heart--upside down. In a world where personal information is always one click away, Jamie must decide if he should trust his heart or watch the woman he loves walk away. 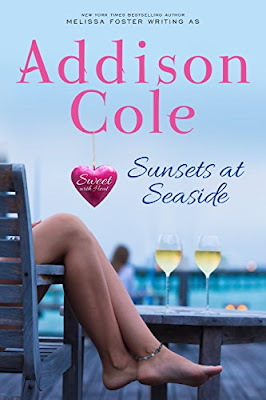 I adore the Seaside Summers series, and Sunsets at Seaside was another great addition! Having met Jamie in books 1-3, I was excited to see him get his own book. He and his grandmother Vera are such a great pair and it was great to see him meeting a great girl. I liked Jessica from the start and loved how well she fit in with the group of girls. I don't want to spoil any of the fun, but there is a "Thong Thursday" part was a riot and I loved how Jessica rolled with it. I really like the "Sweet With Heat" aspect of the series too- I think the "sweet" stories are just perfect. They have just the right amount of suggestive heat without being too explicit. Looking forward to the next book in the series! Cover Reveal: Thirty Day Boyfriend by Whitney G.